Home / Blog / Advice & Travel Tips / What to pack for the Camino de Santiago hike/cycle? 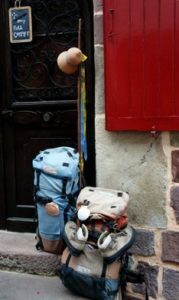 What to pack for the Camino de Santiago hike/cycle? Depending on the route, season and altitude of your Camino de Santiago trip, clothing can vary greatly. As a rule of thumb, it’s better to have more than not enough, and don’t forget, when you book with CaminoWays.com your luggage is transferred from hotel to hotel so you’ll only have to carry a light bag during the day. For all trips, carrying sun cream, sunglasses, appropriate walking boots and rain gear is recommended. 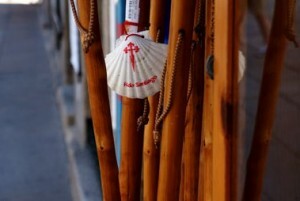 The Camino de Santiago is a big adventure and needs to be taken seriously. We have compiled a list of items we think must be taken with you while walking. It is only a general guide and has to be adapted depending on the person and the part of the Camino walked, but it will give you a good idea of what to bring ! Walking shoes or boots for mountainous terrain and in Winter time. Remember your shoes are the most important part of the gear so try them before you go, do not travel with brand new shoes. Socks for walking and other socks for the evenings. Merino wool is best: light, no smell and no irritation. Change of clean socks each day can make a huge difference. Hiking trousers. Convertible are recommended. No jeans or tracksuits. Books. Avoid taking weight in your backpack but bring a reading book along, if you book with CaminoWays.com, since your luggage will be transferred. Basic First Aid Kit with plasters for possible blisters. There would be many pharmacies along the Camino but language can be a barrier. Bring any medication you might need with you. However if you are looking for aspirin, paracetamol or panadol, they can be easily obtained in the local towns. Packing for any long distance trek or cycle can become a mountainous task so break it down into mini tasks. Don’t feel overwhelmed and keep a packing checklist for the Camino to tick one thing off at a time. Check the forecast before you go! There is nothing worse than to bring the wrong gear to the trip. Always check the weather online, the type of route you are taking, before you go as this can determine what you will need. For a free Camino checklist and all of the packing requirements you can download our free Camino Packing Ebook. Hi Chris, the bikes come with a tool/repair kit useful in case of puncture and basic maintenance. We can’t really offer hands-on assistance but we can put customers in contact with the bike rental company, or help you find details for the closest bike shop in case of bigger problems with the bike. I hope this helps. what back up support is there if any of the bikes develop problems such as punctures , chain problems etc ?